Back in August I got the chance to meet Caroll Spinney, the actor and puppeteer behind Big Bird and Oscar the Grouch in Sesame Street. He was across in Belfast along with Oscar to film an episode of Northern Ireland's own Sesame Tree. You can catch up with my interview with both Oscar and Caroll in the August post. This morning saw the launch of the second series of Sesame Tree in the QFT. While Martin McGuinness was famously pictured with Muppets Potto and Hilda at the launch of the first series of Sesame Tree, the local co-production with Sesame Workshop, today he was accompanied by fellow eejit (his words, not mine) Peter Robinson. 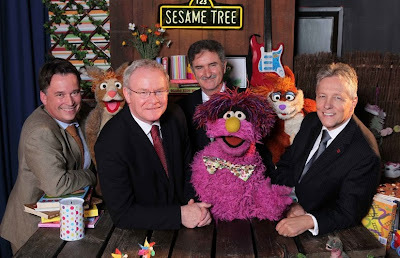 Referring to Sesame Tree – as well as productions being filmed in the Paint Hall – Martin McGuinness was gratified about “the skills that [local] people are learning … that will lead to other projects”. He noted the “key messages of tolerance, acceptance and equality” embedded in each episode. The show’s executive producer Colin Williams explained that Sesame Tree was the first network children’s television “100% written and produced in Northern Ireland with an entirely local cast and local crew”. The BBC’s Jane Cassidy said that CBeebies were delighted with the localness of the show: “[CBeebies] love us the way we are with our accents and humour”. I spoke to Sixteen South's Colin Williams and Sesame Workshop's Charlotte Cole afterwards. When the adults had finished their speechifying, children from three local schools involved in the show’s production were ushered in to the front seats and sat entranced as they watched the first episode before taking part in a live Q&A with Potto (a big purple recluse), Hilda (a young Irish hare who wears gutties) and their new friend Archie (a next-door neighbour squirrel). In each episode, a child from across Northern Ireland poses the puppets a question (linked back to the Northern Ireland curriculum) sending it through to Potto’s Big Whizzing Machine. Having failed to learn my lesson with Oscar, after the launch I spoke to Oscar and Archie - as usual, Hilda wasn't around as she'd scooted out of the tree. Potto started by talking about his inventions. "Potto’s Big Whizzing Machine". Don't they know what "having a whizz" is a euphemism for ...?